Unicorn Training has successfully reached an out-of-court settlement to protect its intellectual property (IP) rights, along with those of partners International Cooperative and Mutual Insurance Federation (ICMIF), for Unicorn’s unique insurance business simulations. Unicorn Training’s business simulations have been used on executive development programmes in over 30 countries worldwide, and it was the most widely used of these, the strategic insurance models, that were at the heart of the protracted legal action. 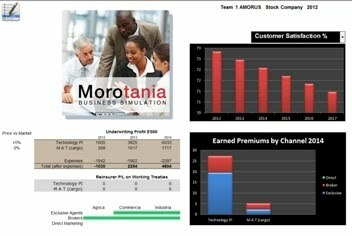 The general insurance model ‘Morotania’, the reinsurance simulation ‘ReAction’, and ‘Genris’, a model derived from and combining elements of both, are owned by Unicorn Training. None of these simulations can be offered by any third party unless they have a licence from Unicorn Training or ICMIF. Peter Phillips, director at Unicorn Training, the 2011 eLearning Development Company of the Year, said: “Taking legal action has been a long and expensive process, but our intellectual property is at the heart of the Unicorn business, and we were determined to protect that IP vigorously and with the full force of the law. I am pleased, that in the end, we avoided the need for a High Court appearance by reaching a satisfactory settlement.” During Unicorn’s business simulations events, participants practice and improve their business skills through planning and running a business venture in a simulated competitive environment. Unicorn are strong believers in action-based learning, putting participants into intellectually-challenging situations that are context rich, practical and memorable. Peter added: “Taking legal action is a stressful and complex process, so I would particularly like to thank our solicitor, Robert Bajaj of Steele Raymond, and our barrister, Tim Penny of 11 Stone Chambers, who were both invaluable in guiding us through the legal minefield to a successful outcome. I would never recommend anyone to embark on legal action lightly, but if you do so, make sure that you have the support of high-quality professional advisers.” Unicorn Training is the 2011 eLearning Company of the Year.